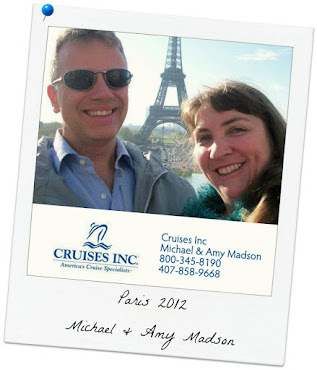 After a fantastic river cruise aboard Avalon Creativity April 19-26, 2011 roundtrip from Paris through the enchanting French countryside to the historic beaches of Normandy, we can’t wait to go back. We’ll be escorting a group on the same ship and itinerary for the April 10, 2012 sailing! We flew into Paris Monday, the evening before the cruise, and stayed at the Pullman Paris Montparnasse, the same hotel that Avalon uses for its pre-cruise packages. (The rush-hour cab ride from the airport was long and expensive. We would recommend looking at the train; there’s a main station right across the street from this hotel.) The hotel looked recently refurbished and the staff was polite and helpful. We headed out to explore the neighborhood just as the lights were coming on and the cafés were filling up. We decided to have dinner at le Relais de l’Entrecote. It’s easy to order because all they serve is Steak Frites (steak and fries) and the do it extremely well. You get several slices of perfectly cooked steak with their secret-recipe sauce and a mound of the best-tasting French fries you’ve ever had (of course they just call them fries). When you finish that, they just bring you another plateful! After some more wide-eyed wandering we went to the Montparnasse Tower, the only skyscraper in Paris proper. From the 56th-floor 360° observation room we had an unbelievable view of the city and a perfect seat for the Eiffel Tower twinkling light show at the top of the hour. At 8:30 the next morning, Tuesday, our Cruise Director, Jean-Loup Domart, was set up in a large lounge in the hotel; beverages were available, luggage was being staged for transfer to the ship, and carry-on bags could be safely stored here. Included transfers to the ship would begin at 3:30 in the afternoon and passengers whose flights arrived this day were brought here from the airport to relax. 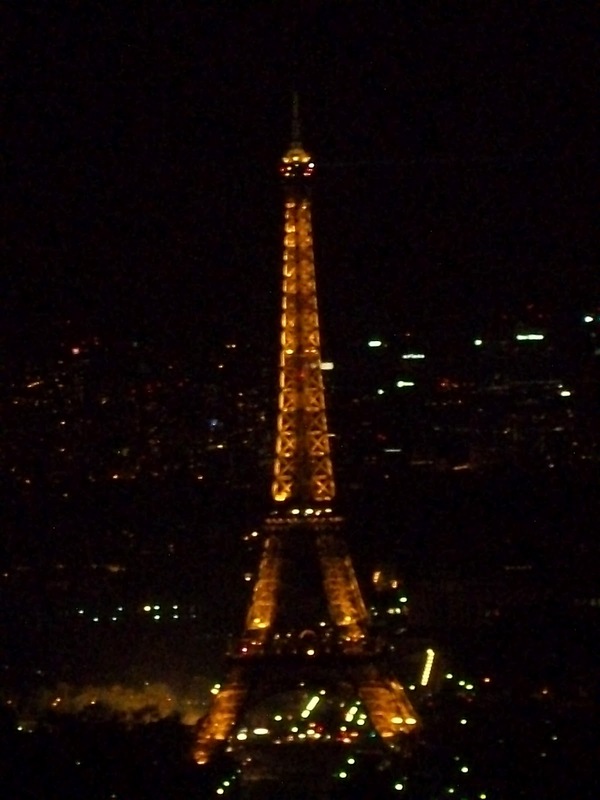 You could also purchase an optional tour to the Eiffel Tower that left at 1:30, included access to the second observation deck with no wait in line, and then transferred you right to the ship. We elected to head out on our own a little more. The Montparnasse cemetery is a city unto itself and the mementos left daily at the grave of philosopher Jean-Paul Sartre were fascinating. We explored the Latin Quarter and numerous parks culminating in the Luxembourg Gardens and a nice lunch at La Gueuze, which turned out to be a Belgian restaurant. When we reached the Avalon Creativity we found a sleek vessel with sharp, contemporary décor. The focus of the ship however, is obviously to turn your attention outward, towards the passing scenery. All of the public areas are surrounded by windows and the floor-to-ceiling sliding glass door in most cabins turns your entire room into a balcony! And on top of it all is the Sky Deck with ample seating and unobstructed views everywhere you look. Our cabin (228) was the Avalon-standard generous 172 square feet (suites are even larger) including a relatively spacious bathroom with a great shower stall. There is ample storage in both the cabin and bathroom but, oddly, it was all cabinets – a few drawers would have been nice. The Club Lounge aft on deck three features always-available coffees and teas, fresh fruit and cookies as well as a small library and a number of board games. Opposite this, forward on deck three, is the main Lounge, home to the bar, plenty of comfortable seating and the ship’s entertainer, keyboardist Mitko. Big ship cruisers will enjoy the fast, friendly service here and love the absence of automatic gratuities! The Lounge is the main gathering place on the ship for organized functions. We had daily port talks from our Cruise Director and outside entertainment brought aboard including a classical music trio (La Strada), a D-Day and Normandy historian (Nigel Stewart) and a local pastry chef who taught an éclair cooking class. Entertainment highlights of the week were the crew show and an authentic French cheese tasting seminar. On deck two just below the Lounge is the Dining Room where all meals are open seating, encouraging interaction with your fellow travelers. On our voyage, all 136 of the passengers were from the United States, Canada, Australia and New Zealand; all were well-traveled and eager to share their stories. Most of them were primarily land tour travelers – there were very few big ship cruisers in the mix. It seems that ocean cruisers have yet to discover the joys of river cruising. Breakfast and lunch are served buffet style, each with an item or two that can be ordered from the galley if desired. The breakfast offerings didn’t change much and could get a little repetitive on a longer voyage. Surprisingly, the complimentary sparkling wine and mimosas offered at breakfast went largely untouched. The lunch buffet has plenty of variety and always included freshly made pasta and hand carved meat. As an option on several days, weather permitting, they offer lunch outside up on the Sky Deck featuring freshly grilled steaks and sausages. This is delicious, don’t miss it! Due to limited space (only 36 seats) they ask you to sign up for this ahead of time and to give other passengers first chance at it once you’ve experienced it. Dinner is an event with five-course meals (seven courses on two of the nights) and free-flowing wines from the region you’re cruising through. All of the food is freshly prepared, attractively plated and properly portioned. Most importantly, it all tastes great! The chef does an outstanding job making sure the courses all complement one another as well as the wines. Interestingly, the breads are about the only thing not prepared from scratch in the ship’s galley. When asked about this, chef Michael Baptiste responded, “We’re in France. They bake the best bread in the world. Why would I bother?” He’s right, the bread is fantastic! The ship remains docked in Paris for the first two nights. Wednesday morning there was an included sightseeing tour of Paris. The motor coach wove its way through traffic and made sure we got the best views of all the important monuments in this magnificent city while a local expert provided a running commentary of the stories behind everything. There were a couple of stops at the best photo spots and the option of being dropped off in the city to explore further on your own rather than returning to the ship for lunch. Wednesday evening, in lieu of dinner aboard the ship, you could purchase an optional trip to dinner and a show at Moulin Rouge, the infamous Parisian cabaret. Those who opted for this excursion came back with rave reviews! Early Thursday morning we sailed from Paris and the crew was on hand up on the Sky Deck to make sure everyone ducked as we passed under some very low bridges. The views of the city were great, but the people living on all manner of house boats along the Seine were the focus of many a camera. Thursday afternoon we docked at Conflans-Sainte-Honorine and had to choose between two included tours. One went to Chateau Malmaison, the 17th century castle that was a favored retreat of Napoleon I and his first wife, Josephine. The other went to Auvers-sur-Oise, the town where Vincent van Gogh spent the last months of his life. Seeing reproductions of his paintings displayed in front of the buildings and landscapes that inspired van Gogh, right where he would have stood to paint them, really gave the artwork so much more meaning. After the tour, we spent some time exploring the warren of cobblestone alleys in town and found a small bakery where we picked up some local pastries and macaroons. Friday morning we docked in Vernon, and once again had to choose one of two included tours. One went to the tiny village of Giverny to visit Claude Monet’s house, studio, gardens and famous water lily pond. The other included a walking tour of Vernon followed by a trip to Chateau de Bizy for a tour of the palace and gardens. That afternoon we had a couple of hours to explore Vernon on our own and get in a little shopping. Saturday morning we were docked in Rouen and enjoyed an included walking tour of the city. From the massive gothic Cathedral to the Great Clock-Tower, from the half-timbered 15th century houses to the square where Joan of Arc was martyred, there seems to be no end to the sights and history of this town. Saturday afternoon you could elect to purchase an optional trip to the historic port of Honfleur. The tour included stops at a huge Salt Barn now used as an art gallery and the 500-year-old Church of St. Catherine, the oldest wooden church in France. We had time to explore the marina and its surrounding cafés and shops where we picked up some of the local specialty, salted butter caramels, at La Cave Normande. On Sunday we had to again choose one of two included tours, both day-long trips to Normandy. The “Taste of Normandy” explored the countryside and small towns and included features like Camembert cheese, Calvados apple brandy and famous tapestries. The “Normandy Landing Beaches” was an incredibly moving and educational experience. We visited Gold Beach and learned about the extraordinary engineering feat of mobile harbors at the Arromanches Museum. At Pointe du Hoc we saw the broken, cratered countryside – the result of days of continuous bombing – and climbed through shattered concrete bunkers and the surprisingly intact German command center. We went to Omaha Beach, the scene of the heaviest fighting of the D-Day landings, and finally to the American Military Cemetery for a moving ceremony among the final resting place of 9,387 brave soldiers. Monday morning we docked in Les Andelys, a picturesque little French village overlooked by the remnants of Chateau Gaillard, a fortress built by Richard the Lionheart in the 12th century. You could choose between two included walking tours; one through the town to the church, parks and gardens, the other a more strenuous hike up to the Chateau. After the tours there was still time to stroll along the river and visit the bakeries, shops and cafés. Monday afternoon (and on through the night) was spent cruising back to Paris with more magnificent views of the beautiful passing scenery. Always keep your camera with you, as you never know what amazing sites you’ll be sailing past!!! Perhaps the best way to describe this river cruise is by using words like enriching, engaging, informative, fascinating, and emotional. We learned so much, and we enjoyed it immensely! We were spending an extra day in Paris after the cruise and the ship’s ever-helpful staff arranged for a taxi to pick us up and take us to our hotel Tuesday morning. The Hotel Mercure Paris Haussmann Saint Augustin is a cross between the old (tiny elevator, windows that look right into the next building) and the new (included high speed Wi-Fi, flat screen TV). 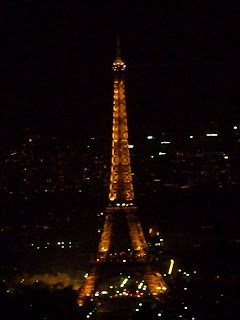 The staff was very friendly and helpful and the location between the Champs-Elysees and the Madeline was fantastic. We found the Metro convenient and easy to navigate as we made our way up to the Montmartre area. We saw the world famous Moulin Rouge and wound through steep streets surrounded by amazing architecture. The Place du Tertre was crowded with artists and packed with tourists, but just a couple of blocks away we discovered Le Deli’s Café. This quaint little restaurant was just outside the crowds and we were treated to a huge, delicious lunch at a good price. After visiting the magical castle Sacré-Coeur at the summit of Montmartre, we began working our way back down with stops to browse and shop. Among all the various souvenir shops though, La Cure Gourmande stood out like a beacon in the dark. This little store, with its bright colors and displays out of a fairy tale, sold an amazing array of cookies, candies and chocolates available nowhere else. After another Metro ride we window shopped along the Champs-Elysees and stopped at Ladurée, home of the world-renowned perfect Macaroon. Later that evening we had dinner at Le Saint Augustin; good food and a great spot to people-watch. The hotel arranged for a private van to pick us up the next morning and take us to the airport at a reasonable price. It was hard to leave the city of Paris behind as there is so much more we wanted to experience…we’ll be back. This was our 41st cruise but only our 2nd river cruise. With river cruising we’ve found the personal touch and attention to detail that we miss from our big ship cruises of ten or more years ago, plus an up-close, in-depth experience that really enhances the destination. There was just so much to see and absorb on this trip that we would have enjoyed more time at almost every stop! If anyone else is interested in joining us, we’ll be escorting a group aboard the Avalon Creativity for the April 10, 2012 sailing of the same itinerary. Happy cruising!